The South Bend Museum of Art’s Permanent Collection grows each year with the acquisition of artwork that is either donated or purchased, with a representation on display at any one time in the Carmichael Gallery. Through An Artst’s Eye invites the viewer into the intimate setting of the Jerome J. Crowley Community Gallery to view several recent acquisitions to the SBMA’s Permanent Collection. Ranging in size from Adrian Hatfield’s diminutive Disrupted Façade to Maxwell Stolkin’s enormous Night Sky With Spectra, the show also includes artworks by artists Phyllis Bramson, Sandra C. Fernandez, Cheonae Kim, Joe Matthews, Joseph Ruthrauff, and Guy Brown Wiser. The artworks, primarily paintings, are of disparate styles, ideas, and mediums, but they all share one commonality: they are the artists’ representations of the world. The word “representation” suggests a likeness of something — in this case, an artist’s own translation of various ideas and concepts; some are familiar; others, surreal. Artists use their own lenses to show the viewer their own translations and perspectives of everyday and ethereal worlds. 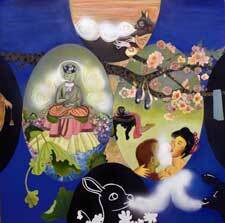 image: Phyllis Bramson, Breathing Lessons, 2008, Oil, mixed media and collage on canvas, 60 x 60 inches, 2012.4, Gift of the artist in honor of Herman and Esther Halperin.